It was a sunny winters weekend that welcomed Aycliffe Juniors football teams to their games and there was plenty of action to enjoy. The Under 7’s Whites maintained their good form with a 5-1 win against Durham United Tigers. An own goal was added to by Jack R (2), Jack C and man of the match Tyler in a good team performance. The Under 8’s enjoyed a great matchday experience with Newton Aycliffe FC on Saturday then on Sunday played away at Billingham. Despite a great effort they lost out 8-3, Alex, Evan and Harry scored with George the man of the match. The development game ended in a 6-3 win with George (3), Harry (2) and Jack the scorers. The Under 9’s lost 2-0 at Hartlepool everyone worked hard with their attitude and focus excellent however they couldn’t take anything from the game. The whole team were named as players of the match. The development game was more open and Callum scored in a 4-1 defeat with Oscar the man of the match. The Under 10’s White were away at Leven Royals and scored the first goal through Ethan Churcher after only 10 seconds. However it was the home team who dominated and despite an own goal in Aycliffe’s favour the match ended in a 7-2 defeat. Ido Sandler in the Aycliffe goal was the man of the match. The Under 10’s Claret played away at Stranton FC. They started well and a great goal from Josh put them in the lead. The hosts though worked their way in to the game and came away as winners. Harrison was named as man of the match. 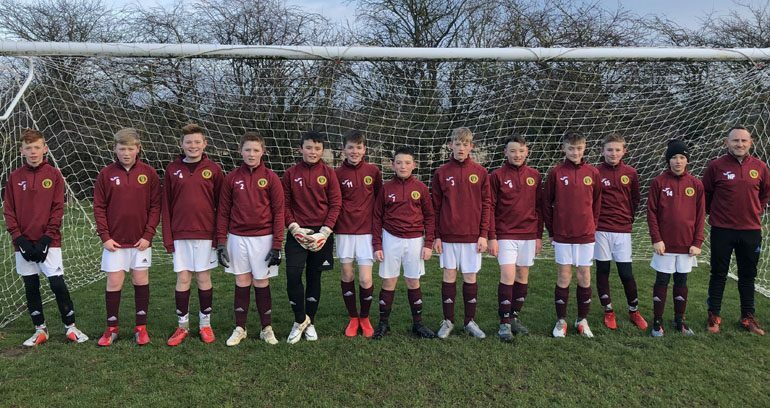 The Under 11’s White played away at TIBS in an entertaining game where both goalkeepers were named as men of the match, Jack Lowis was the Aycliffe keeper. Niall and Aidan Armstrong scored in a match that ended 2-2. The Under 11’s Black went down 1-0 early in a game at home against Cargo Fleet. They battled well but couldn’t get in to the game and slipped to a 4-0 defeat. Alyssa was the player of the match. The Under 12’s travelled to Hartlepool to play Saxon Juniors. A good effort saw them through to a 6-2 win with a hatrick each for Alfie Brown and Zak Seymour, Charlie Etheridge was the man of the match. The Under 13 Russell Foster League team hosted Whickham Fellside Whites and they put in a great battling performance to secure a 2-2 draw. Herbie got both the goals and was named as joint man of the match with Fin. The Under 13 TJFA League team welcomed Stockton Town to Woodham but found themselves two goals down early in the second half. A spirited comeback followed and Liam headed in Zack’s corner to make it 2-1. Unfortunately there was no equaliser and the game ended in a one goal defeat. The Under 14’s travelled to face Brompton and despite enjoying the lions share of possession they couldn’t break their hosts down. The match ended 0-0 bringing their unbeaten run to an impressive seven games.